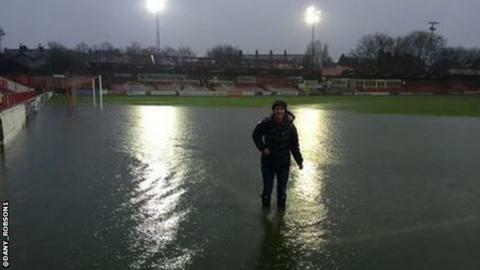 Several Boxing Day sporting fixtures have been postponed across the UK after heavy rain fell on Saturday. The Championship football match between Blackburn and Middlesbrough and League One games Blackpool v Oldham and Wigan v Sheffield United were called off. More than 200 flood warnings and alerts have been issued, with seven severe warnings in place for Lancashire. Sunday's Welsh Grand National meeting at Chepstow is also off, as is the two-day fixture at Wetherby. Other football matches which fell foul of the weather were Bury v Barnsley, Accrington Stanley v Carlisle, Morecambe v Mansfield, Hartlepool v Notts County and Rochdale v Crewe. Carlisle - who were due to face Accrington at 15:00 GMT - played their last home game at Preston North End's Deepdale stadium after Storm Desmond left their Brunton Park ground under water. Stanley manager John Coleman criticised the decision - before later apologising - saying it was not "fair". Accrington's last two home matches have also been called off. Dundee United's Premiership match against Motherwell is one of several Scottish fixtures postponed on Saturday because of waterlogged pitches. Several Scottish games have also been postponed - read the full list here. Notts County tweeted: "No days off here. The lads are now training this morning!" How did Lawro get on v the super-computer?